We've all heard it said, "Your life is too loud for me to hear what you say." This means a person is not living the Christian life, so others won't listen to you "preach" at them - they see how you actually live. But the reverse is also true. If we are truly saved, are truly living the Christian life, there will be fruit evident even to those who are outside the Body of Christ. They may not be able to put into words what's different about us, but they will most certainly notice and the Holy Spirit can use this to draw them to Him. There are so many small ways we can show the love of Christ to this world, we just need to keep our eyes open so we see the opportunities. One easy way is when we are shopping and have a coupon we decide we won't use after all. Give it to someone who is looking at that type of product or just leave it laying on the item it's for. If you have a more general situation, say "$5 of a $20 purchase", just ask God to show you who to give it to. You'll both be blessed! 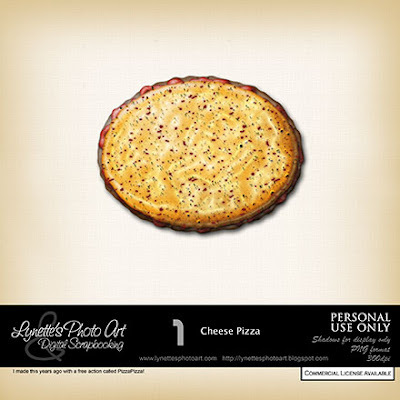 Today I'm giving you a yummy Cheese Pizza for all those summer picnic & party LOs. I made this years ago using a free action called PizzaPizza! Thank you! Your blog post will be advertised on the DigiFree Digital Scrapbooking Freebie search engine today (look for timestamp: 30 Aug [LA 07:00pm, NY 09:00pm] - 31 Aug [UK 02:00am, OZ 12:00pm] ). Thank you so much for this Freebie. I want to let you know that I posted a link to your blog in Creative Busy Hands Scrapbook Freebies Search List, under the Page 8 post on Aug. 31, 2009. Thanks again.